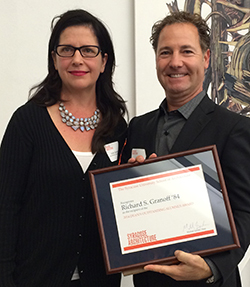 During Orange Central weekend at the School of Architecture on Oct. 11, Richard S. Granoff ’84 was named the 2014 Dean’s Outstanding Alumnus. The award is given annually to an alumnus of the school who exemplifies excellence in both professional practice and engagement with the school. Richard Granoff receives the alumni award from Associate Dean Julia Czerniak. In 2009, Granoff established the Richard S. Granoff Scholarship in Architecture, awarded every year to a student in the school. Granoff also recently joined the School of Architecture Advisory Board, where he will work with the dean to assure the school’s continued excellence. Granoff started his career working with fellow Syracuse Architecture alumnus David Rockwell. In 1989, he launched his own firm in Greenwich, Conn. Granoff Architects has enjoyed tremendous success over the past 25 years in nearly all areas of architecture, from landscape projects to corporate interiors to residential design. He also employs a number of Syracuse Architecture graduates. “Quite simply, [Syracuse graduates] are the best employees in my office. They are my go-to ‘A’” team,” said Granoff. He has appeared on national media programs such as “Good Morning America,” “High Net Worth” and “MTV Cribs.” His work has also been featured in numerous publications, including The New York Times, Veranda and Fine Homebuilding. In addition to the award-winning work with his firm, Granoff has developed a real estate company investing in residential and commercial projects in the tri-state area. Granoff’s wife, Jill Granoff, and his two sons, Jake (a current third-year student in the School of Architecture) and Noah, reside in Greenwich.